We’d love your help. Let us know what’s wrong with this preview of Who Owns the Future? by Jaron Lanier. Jaron Lanier is the father of virtual reality and one of the world’s most brilliant thinkers. Who Owns the Future? is his visionary reckoning with t The “brilliant” and “daringly original” (The New York Times) critique of digital networks from the “David Foster Wallace of tech” (London Evening Standard)—asserting that to fix our economy, we must fix our information economy. Lanier has predicted how technology will transform our humanity for decades, and his insight has never been more urgently needed. He shows how Siren Servers, which exploit big data and the free sharing of information, led our economy into recession, imperiled personal privacy, and hollowed out the middle class. The networks that define our world—including social media, financial institutions, and intelligence agencies—now threaten to destroy it. To ask other readers questions about Who Owns the Future?, please sign up. p. 39 what are the variables on the axes of the winner-take-all distribution? on the bell curve, the characteristic being measured is on the x-axis and the number of individuals who have it the y-axis: most people are near the numerical average, not very many at the lower and upper tails. maybe on the winner-take-all, the x-axis is some measure of how good you are, and the y-axis is how many people like you? The recent exposure of government surveillance of tech companies and their private consumers is sobering, but I confess it is not wholly unexpected. After all, the corporations monitor our tastes and actions already for advertising purposes. Who is to say the intelligence services would not have caught on to this rich new vein of information, free for the taking? The purpose of this book is a critique of this new trend of information control, and Lanier, our author, has a reputation of lambasting The recent exposure of government surveillance of tech companies and their private consumers is sobering, but I confess it is not wholly unexpected. After all, the corporations monitor our tastes and actions already for advertising purposes. Who is to say the intelligence services would not have caught on to this rich new vein of information, free for the taking? The purpose of this book is a critique of this new trend of information control, and Lanier, our author, has a reputation of lambasting the idlers of Silicon Valley. However, this book is of wildly erratic quality. Our author is able to accurately diagnose our current problems but offers little in the way of solutions, or even explaining what he does get right. Notes the importance of automation in the loss of manufacturing jobs, and the possibility of automation expanding to everything from janitorial services to nursing. The new 'Information economy' rewards some tycoons and entrepreneurs disproportionately well, but many others lose. The role of derivatives and high-speed trading also made and lost many fortunes in the financial industry. Likewise, Lanier expands upon the increasing rule of 'Siren Servers' - companies which provide services to the average consumer for free, but earn money packaging personal information to others, or using it to further target their sales and advertising - e.g. Google Ads, Facebook, Amazon. No mention of Microsoft, which employs our author. This book has two major flaws: first, no practical solutions, aside from sticking some more Silicon Valley executives in a boardroom, or some ideas which are bizarre at best, with no real descriptions of implementation. For example, consumers are to be paid every time our 'identity data' is used when we use a social network. I liked this book, and I can't recommend it, except for the most dedicated technophile. This book is like being stuck in an elevator with your most brilliant friend, and a bottle of wine. Some of the conversation will be interesting, and some of it may seem brilliant, but you won't be able to remember half of it later. His musings range from mild to extreme, and much of it I did not feel like I had the brain power to understand its implications. I would have to read it a second time, just to get I liked this book, and I can't recommend it, except for the most dedicated technophile. This book is like being stuck in an elevator with your most brilliant friend, and a bottle of wine. Some of the conversation will be interesting, and some of it may seem brilliant, but you won't be able to remember half of it later. His musings range from mild to extreme, and much of it I did not feel like I had the brain power to understand its implications. I would have to read it a second time, just to get a real grasp. Should you read this book? Yes. There are three reasons why: 1. His prescriptions may be useful. 2. Even if his prescriptions are unrealistic, the first two-thirds of the book are still a worthwhile way of looking at what's presently going on in our economy. 3. Even if he's totally wrong, he's entertaining, rather like Antonin Scalia. I haven't read any coherent negative reviews of this book, mostly negative reviews by people who have grasped 1% of the argument from reading about it online and a Should you read this book? Yes. There are three reasons why: 1. His prescriptions may be useful. 2. Even if his prescriptions are unrealistic, the first two-thirds of the book are still a worthwhile way of looking at what's presently going on in our economy. 3. Even if he's totally wrong, he's entertaining, rather like Antonin Scalia. I haven't read any coherent negative reviews of this book, mostly negative reviews by people who have grasped 1% of the argument from reading about it online and are criticizing that. You could fault the author for being polemical and long-winded, but if you're reading my reviews, that's probably not an issue for you. Lanier describes a system centered around what he calls, as shorthand, a Siren Server--a powerful computer system that amasses so much information that it (perhaps unintentionally) bends the market reality around itself. A Siren Server allows its master to pull unprecedented amounts of money or power to itself, while radiating risk onto smaller players into the economy in ways that mask the connection between the risk and its own actions. He asserts that a "sirenic" economy endangers capitalism because it allows certain players to grow to unprecedented size while actually diminishing the overall economy. In the short term it's primarily affecting a hobbled middle class, but in the long term a shrinking economy is not good for the Siren Servers, either. He gives many examples. One would be health insurers, who can now find out a great deal about who is healthy and likely to stay that way, and collect premiums from them, while foisting sick people onto emergency rooms and the government safety net. Another would be Wal-Mart, which revolutionized supply chains to its own immense profit, while its reliance on Chinese manufacturing has left its communities unable to afford to buy things even at rock-bottom prices. A less profitable example would be Facebook. The theme linking all of these is: companies (and the odd government agency) in positions of previously unfathomable information superiority, whose algorithms can behave in monopolistic ways even when no human collusion has taken place, having unintended effects on the broader economy. As an alternative, Lanier proposes a new architecture in which micropayments flow to people whose data has made downstream calculations, advertisements, or sales possible. These payments would be tiny, but would restore the middle-class (and all of us) as true participants in the economy. If Facebook uses your behavior to target an ad, they should make a tiny payment to you. If Google uses your translation to inform its statistical translation algorithm, they should pay you. Lanier makes odder suggestions, too. If your mortgage gets sliced up and resold, it's based partially on your likelihood of repayment so you should be paid--and even with micropayments, the cumulative cost of that might have slowed down the housing bubble. If a dating site uses your successful match as fodder to understand how to match future pairs, who marry: payment to you. The idea isn't just that you'd make a little bit of money, but also that the Siren Servers should not be allowed to use you as the raw materials of their business for free. This sounds a little out there, but Lanier isn't a hippie (despite his hairdo). He's not in favor of file-sharing and the social web, but not in a pathetically fuddy-duddy MPAA anti-piracy ad kind of way; he quotes Marx, but he is fine with some people making loads of money as long as other aren't left in the dust. His politics are hard to pin down because they cut across conventional orthodoxies. The result is odd but compelling. He seems to actually know what he's talking about, at a high level few can match, and that's why no one else is saying these things, at least, not yet. Lanier is a member of the supreme information class and he's sharing its secrets with the rest of us. Imagine yourself reading the latest article from your favorite news source on the screen of your smartphone; you might have enjoyed the article enough to share it with your friends on Facebook. You might have also decided to check your e-mail and converse with your friends via a messaging app; all the while paying nothing for the services you used, except the monthly phone bill - or possibly not even that, if you used a device such as a tablet and free wi-fi. But are these services - which infor Imagine yourself reading the latest article from your favorite news source on the screen of your smartphone; you might have enjoyed the article enough to share it with your friends on Facebook. You might have also decided to check your e-mail and converse with your friends via a messaging app; all the while paying nothing for the services you used, except the monthly phone bill - or possibly not even that, if you used a device such as a tablet and free wi-fi. But are these services - which inform, entertain, and connect us - truly free? Someone had to create the digital infrastructure which we use to connect with one another, and create content that we enjoy reading and watching. Yet no money leaves our pockets when we use them all every day. How is that possible? Do people who create content, host and manage social network work unpaid? How can free services be free? The answer lies in the terms and conditions that we accept when we sign up for them and willingly share what is now invaluable commodity - our personal information. In exchange for a free e-mail account or the ability to share videos and pictures with our friends, we willingly give away details about ourselves - age, gender, our choices in entertainment and culture - and the services provide this information to those who wish to purchase it: advertisers who can tailor their ads to be more individual and effective, companies who can learn what type of product is most desired and adjust accordingly. I began reading this book with great interest and enthusiasm - I wanted to know exactly what it promised to tell us - who owns the future? What is done with our information, and how much is it worth to others? What about the questions of privacy and copyright, topics especially important in the age of international networks which made sharing content easier than ever - but also made snooping on millions of people banal? These are all serious and interesting subjects which do get discussed in the book, albeit in a chaotic and unorganized way - after a captivating start the author jumps from one topic to the other, identifying problem but lacking in presenting clear solutions. Interesting ideas he does come forward with raise more problems than they aim to solve - Lanier proposers a creation of a system where users would be paid every time a piece of their original information is used for profit. Ambitious and admirable as the idea may be, how could it work? On what grounds can a piece of information be considered original - if someone creates information - such as a review on Goodreads - based on a information provided by others - a book that they read - is it now original information, or just a paraphrase? Does the author of the original source material gets paid along with the person who used it to create a new piece of information? The book lacks a real vision of how such an idea could be implemented, and any data to back up such claims. Documentary filmmaker Adam Curtis remarked on the increasing fragmentation of stories that the world could use a little less whimsy ("Wes Anderson") and a little more Tolstoy. Jaron Lanier makes a similar point regarding the pitfalls of digitalization and the economic and human cost of erasing context. Even better, he does so without sounding like a raving Luddite. He proposes a system of micropayments that would weave individual contributions into a more stable economic narrative. My cynical si Documentary filmmaker Adam Curtis remarked on the increasing fragmentation of stories that the world could use a little less whimsy ("Wes Anderson") and a little more Tolstoy. Jaron Lanier makes a similar point regarding the pitfalls of digitalization and the economic and human cost of erasing context. Even better, he does so without sounding like a raving Luddite. He proposes a system of micropayments that would weave individual contributions into a more stable economic narrative. My cynical side says it wouldn't work, and I wonder if, after You Are Not a Gadget, Lanier isn't responding to the inevitable critics who -- like readers who insist on likable protagonists -- demand solutions from authors who are doing an important enough job in pointing out the problems. That said, it's a rare treat to read someone who questions, like Curtis, the contradictions and hierarchies that inevitably surface wherever we hear the word "free." “To my friends in the “open” Internet movement, I have to ask: What did you think would happen? We in Silicon Valley undermined copyright to make commerce become more about services instead of content: more about our code instead of their files. The inevitable endgame was always that we would lose control of our own personal content, our own files. This book is a labor of love. We humans are being gifted the secrets of our internet universe today. Reading this is little like a taking a course (a whole course) with a particularly beloved and brilliant professor who doesn’t hold back any secrets that we might be able to glean from his lectures. Lanier describes a late-night dinner in the shambolic Brookline house of one of his MIT professors, Marvin Minsky, which spurred him to great flights of thought and coding. This book is a little like those precious moments. This book is free information! and you must know by now, friends, that information is the gold standard today. But more importantly, with this information you can participate in the discussion about how to manage scarcity and wealth in today’s society which is accruing unevenly and, according to Lanier, unfairly. It is a huge question at the center of how we interact, and who is paying attention to those interactions. His discussion allows us to understand a little better the causes of the effects we all notice in our online interactions, e.g., the stickiness effect of trying to leave or quit a provider, the quick rise and/or cannibalism of internet start-ups, the fact that often we are liable for every risk in using the computational instruments necessary in our lives, and yet the cost is ours as well. How does that work out? Well, some folks are making plenty on our interactions/information. It has something to do with “Siren Servers” and big data. Remember Odysseus and the songs of the Sirens? This book has other life lessons as well. Another reviewer said she enjoyed it like reading a “shaggy, ambitious novel” and it is a little like that: a little sci fi, a little horror, a little mystery, lots of thrills…entertaining doesn’t quite describe it. It opens a world we may not have understood adequately especially if we work outside the computer field, but it still speaks to those folks as well. It points to a huge problem at the center of our world and asks how best to solve it. Lanier sets himself apart from those discussing “The Singularity” and remembers the human behind every optimal computer decision. He poses the beginnings of solutions to the problems he recognizes, but basically, he is asking for input and participation. Like the man says, any system we create always needs tinkering. It can’t ever be perfect. It can get better. Lanier speaks so naturally, in this book and in interviews, of things that are mysterious to most of us…Siren Servers that pull information to themselves and create vortices of information and wealth. Lanier suggests creating two way information networks so that each of us is compensated for the value we create. It is a huge idea, but Lanier has a history of huge ideas. He may have lost me just a little at the end when he begins to talk about the logical outcomes of decisions made early on in the process, but the conceptual project as a whole I find intriguing and probably as possible as what we have done up to now. It’s mind -boggling and –expanding at the same time: a very cool feeling. I really learned things here. I definitely like his central conceit: that humans are the value in this equation. We just have to make it logical that some portion of whatever we have that big data values accrues to us. And I do love the discussion near the end when he is considering outcomes and tweeks, and makes the suggestion (he doesn’t actually suggest it, but the proximity of his arguments leads one to imagine he suggests) that derivatives markets and casinos—the networked, obsessive feedback loop—be sicc’ed on the carbon credits market: “it’s all in the timing.” He admits to issues with everything he is suggesting, but it is completely compelling none-the-less. At the very end, on page 300, Lanier explains that the old-fashioned way of handling discrepancies in the market, “regulation” of the powers that be, has not worked since late in the 20th century. He suggests that possibly his new system would take care of that…by allowing risk and cost to be shared between servers and the polity, restoring, or at least correcting, economic symmetry. Part of Lanier’s thesis is that machines are not now as smart as humans, and without humans, never will be. "We do know that Siren Servers can die. It happened to Lehmann Brothers... Individual Siren Servers can die and yet the Siren Server pattern perseveres, and it is that pattern that is the real problem. The systematic decoupling of risk from reward in the rising information economy is the problem, not any particular server." I'm sure much savvier readers and technologists than me will roll their eyes at a neologism like "Siren Servers," Jaron Lanier's nickname for the entities (Amazon, Facebook, G "We do know that Siren Servers can die. It happened to Lehmann Brothers... Individual Siren Servers can die and yet the Siren Server pattern perseveres, and it is that pattern that is the real problem. The systematic decoupling of risk from reward in the rising information economy is the problem, not any particular server." I'm sure much savvier readers and technologists than me will roll their eyes at a neologism like "Siren Servers," Jaron Lanier's nickname for the entities (Amazon, Facebook, Google*, government surveillance apparatuses, etc. along with some less-obvious manifestations like Goldman Sachs, Wikipedia, Wal-Mart, and health insurance companies) that use powerful computing and the perfect bet that is Moore's Law to consolidate power and/or wealth that they haven't really earned under their own control, and, most dangerously, radiate risk outward. That would be unfortunate, in my opinion. "Not long after Jaron’s birth, his parents abandoned their last name, Zepel, for the less Semitic-sounding Lanier, after Sidney Lanier, a nineteenth-century poet and flutist, whom Ellery admired." Jaron Zepel's parents knew the power of names in the game of self-preservation in a cruel world. I would argue that the entities listed above are also familiar with the power of names. This book is as dark and filled with ancient, Jungian forms of dread as its central metaphor implies. It is filled with practical suggestions that I think have been too casually dismissed by other reviews. His suggestion of paying people for when their data is useful doesn't pass the creepiness test that he himself discusses at length, but Zepel is making a larger argument that these companies will allow business and technical forms of accountability as long as they are applied across the market to all of the big players. That will take a lot of political will, but less than I think we fear. As emotionally taxing as it is, there were long swaths of this book that I loved reading the way I love reading a good, ambitious shaggy novel. Zepel writes passionately about putting the needs of technology below the needs of people, using specific examples from the sci-fi canon to illustrate what he means in an unemotional manner. The biggest flaw of the book is that it does not engage the research that Clay Shirky discussed in Cognitive Surplus, that suggests that paying people to do things that they do to feel accomplished or connected changes how they feel about these things, for the worse. I've read one Shirky, one Zepel, and another book called Database Nation, and it is striking how much personal experience colored these apolitical, non-fiction books. Shirky once underestimated the appeal of self-designed web page hub Geocities, and promised never to make that mistake again. Zepel attended one too many fundraisers for music producers and musicians needing medical coverage and finally decided that a Siren Servers-run economy, at least in current, hegemonic incarnation, is, like Communism, an experiment responsible for too much bad to be good. They are writing what they know. Attempting to be as machine-like and objective as possible, but at the same time their humanity, appreciation for irony, and respective wealth of real life experience show through. They are biased, but that is a strength not a weakness. Bias means you have skin in the game. Zepel is arguing, essentially, that we should start coding what we know, not just what is easiest and most popular, and appreciating engineers and tech organizations that demonstrate an appreciation for human scale, irony, and having skin in the game. That's a tempting vision for the future. The first half of Lanier's book is a strong critique of the current trend in computing and business toward aggregation and exploitation of consumer data. He calls companies like Facebook and Google, as well as financial companies that make rapid trades and find loopholes in the markets algorithmically, "Siren Servers." This is a helpful concept and framing of the problem. Lanier then looks to a future dominated by Siren Servers while technological innovation continues to make humans less relevan The first half of Lanier's book is a strong critique of the current trend in computing and business toward aggregation and exploitation of consumer data. He calls companies like Facebook and Google, as well as financial companies that make rapid trades and find loopholes in the markets algorithmically, "Siren Servers." This is a helpful concept and framing of the problem. Lanier then looks to a future dominated by Siren Servers while technological innovation continues to make humans less relevant and valuable except as inputs to algorithms. This is a dystopic picture, and he calls it science fiction upfront. But, it's to make a point. He wants to preserve human dignity, psychologically as well as economically. Lanier's worried about the loss of the middle class and how that will means not only bad economics but a loss of creativity, when we can no longer support, musicians, writers, or even coders outside of the context of Siren Server optimization. Lanier's alternative future is defined by what he calls a humanistic information economy. This economy is built on a technological infrastructure in which anything that is created is personally and perpetually connected to its creator. A universal marketplace system allows creators to be paid royalties whenever their creation is used. This is not just physical and intellectual property, but also our clicks and other data exhaust that feed the algorithms powering Siren Servers. We would be compensated for all this interaction, and this would provide both economic and political leverage that might offset plutocratic tendencies. It's worth a think. This book was a rollercoaster ride. I wholeheartedly agree with his sentiments about needing to reshape technology to suit the needs of human beings and not vice versa, and I think he does a good job of diagnosing the ways in which technology is transforming the economic landscape. That's where my praise ends. From the blurbs, I was expecting something "wildly imaginative" and "ambitious" from a "radical thinker" who has been called the "David Foster Wallace of tech". Instead, I was extremely disa This book was a rollercoaster ride. That's where my praise ends. From the blurbs, I was expecting something "wildly imaginative" and "ambitious" from a "radical thinker" who has been called the "David Foster Wallace of tech". Instead, I was extremely disappointed on all fronts. Given the premises he brings up, the solution he proposes is not even close to radical enough. He limits himself to a very small spectrum of possibilities and thus undermines his own project from the outset: instead of an audacious proposal for how we can use technology to transform our world for the better, he ends with a frankly milquetoast call for more of the same. This is basically centrism.biz in book format. And don't even get me started on the David Foster Wallace comparison (it's almost insulting). It's telling that none of the blurbs are from people who have actually written, from a critical perspective, about the impending collapse of capitalism. There are, in fact, quite a few people who have been writing about this subject in a very rigorous way, but you wouldn't know it from reading this book. When he does mention Marx, he does so in a way that makes it clear that he doesn't care to understand Marx's arguments (or most arguments in the Marxist tradition): there is no discussion of how his proposal to pay everyone "honestly" for the data they provide might actually conflict with the key fuel of capitalism, which is that of surplus value being appropriated by capital. He keeps saying we need to get back to a better capitalism without considering that maybe there isn't a better capitalism to go back to. He would like us to imagine a world in which it isn't just service and factory workers who are exploited for their labour (in the sense that a corporation extracts surplus value from them), but absolutely everyone who creates data that is monetised in some way. Which is really disappointing because he could have so easily gone the other way. Most of the first half of the book is him painting a picture of how new technologies have gotten us to a point where the hegemony of capitalism is under threat. He could have taken the opportunity to explore the ramifications of that, and how we could build a better world where we aren't ruled by the profit motive. Instead, he proposes the most reactionary and conservative solution: let's have more of the same. Let's come up with an absolutely ridiculous (and quite technically convoluted) plan to pay people what their data is "worth", according to some arbitrary measurement, in order to preserve the middle class and thus remain in this neoliberal hellscape a little longer. Rather than exploring the consequences of new technologies for how we could transition to a society beyond capitalism, he has written a book exhorting us to try to save this dying beast, without paying due attention to the much more fundamental question of whether it's worth saving in the first place. Capitalism is, always, the telos. Computer scientist and tech visionary Jaron Lanier has spent his impressive career contributing to many of the most ubiquitous technologies of our time. From virtual reality (a term he coined) to start-up companies that are now a part of Adobe, Oracle and Google, Lanier is a man forever out in front of Silicon Valley’s most forward thinking gurus. In his new book, “Who Owns the Future?” Lanier laments the current state of the middle class and points part of the blame for the loss of middle class Computer scientist and tech visionary Jaron Lanier has spent his impressive career contributing to many of the most ubiquitous technologies of our time. From virtual reality (a term he coined) to start-up companies that are now a part of Adobe, Oracle and Google, Lanier is a man forever out in front of Silicon Valley’s most forward thinking gurus. In his new book, “Who Owns the Future?” Lanier laments the current state of the middle class and points part of the blame for the loss of middle class jobs to the very technological revolution to which he’s contributed his prodigious talents. The erosion of the middle class is, in part, a consequence of technological automation. Think robots on an assembly line. And the fact that the last wave of social internet technologies from Silicon Valley are black holes into which wealth concentrates into the hands of a small few. Lanier uses the example of Kodak, a former Blue Chip company that, at the peak of its power just fifteen short years ago, employed 140,000 thousand people, creating a vast swath of middle class wealth. Today, Kodak is bankrupt, and one of the hot Silicon Valley start-ups that has, of late, become the leading technology product for viewing and sharing digital versions of the photos once printed on Kodak paper is Instagram. Instagram was acquired last year by Facebook for one billion dollars and at the time employed only thirteen people. Lanier posits that technology doesn’t have to cannibalize the middle class as it replaces outmoded ways of doing business. He contends that all of us contributing to the online experience through our blogs, within our social networks and by sharing the music, videos and pictures we create and post online, deserve to be paid for our contributions. Facebook has become the Internet’s dominant social gathering place, with more than a tenth of the world’s population participating. All of us collectively have made Facebook one of the most valuable companies in the world. As of this writing, Facebook is valued at $64 billion, or roughly $76 per user. Yet, most of Facebook’s wealth is concentrated in the hands of a small few. And while Facebook employs a few thousand people worldwide who are no doubt earning upper middle class salaries and stock options that will serve as their retirement nest eggs if properly managed, the wealth Facebook generates is not distributed to a broad enough base for it to be considered a great creator of jobs like Kodak was. Our individual contributions to Facebook are valuable, to advertisers mostly, and for those contributions we deserve to share in the wealth. Lanier raises a lot of provocative points here about the trends of big data and Siren Servers / cloud computing. Warning against the economic impact of tech-fueled market disruption, he makes the case for a middle class of users feeding into the servers. In a future of 3D printers and automated-everything, it will otherwise be easier than ever to be marginalized. Compare the number of employees at Instagram to the number at Kodak in its prime, etc. "Google might eventually become an ouroboros, a Lanier raises a lot of provocative points here about the trends of big data and Siren Servers / cloud computing. Warning against the economic impact of tech-fueled market disruption, he makes the case for a middle class of users feeding into the servers. In a future of 3D printers and automated-everything, it will otherwise be easier than ever to be marginalized. Compare the number of employees at Instagram to the number at Kodak in its prime, etc. "Google might eventually become an ouroboros, a snake eating its own tail, unless something changes," he writes. "This would happen when so many goods and services become software-centric, and so much information is "free," that there is nothing left to advertise on Google that attracts actual money." Lanier has earned his cred; he's had a hand in countless Silicon Valley endeavors, is credited for coining the term "virtual reality," counts Marvin Minsky as a mentor (and entrepreneurs like Jeff Bezos and Eric Schmidt as acquaintances and peers) and was even the first person to see himself in avatar form in a virtual environment. Both this and Radical Markets: Uprooting Capitalism and Democracy for a Just Society (which I haven't finished yet) seem to focus on how to make capitalism work. Which, I sugest, even radical leftists should not dismiss immediately, since today so many just want to disrupt it (and our lives as colateral damage, which their philosophy prohibits them from caring about). Even classic capitalism (where the productive are rewarded and so on) is better than what we are heading towards at high speed. Th Both this and Radical Markets: Uprooting Capitalism and Democracy for a Just Society (which I haven't finished yet) seem to focus on how to make capitalism work. Which, I sugest, even radical leftists should not dismiss immediately, since today so many just want to disrupt it (and our lives as colateral damage, which their philosophy prohibits them from caring about). Even classic capitalism (where the productive are rewarded and so on) is better than what we are heading towards at high speed. The difference in perspective consists in the following. Thinking that capitalism as such does not fulfill its promises and is an ongoing false utopia (more like a carrot in front of you), if you are a leftist. And, on the contrary, tinking that of all, capitalism is the least awfull, in the Churchill tradition, and that trying to fulfill utopias ultimatelly makes society even worse. However, it would be productive if both traditional sides treat as a common threat this too-big-to-fail above the law, 0% taxes randian entrepreneurship ideal where egoism is a virtue and the suffering of others is always their own fault. Jaron Lanier made a work on speculative non-fiction (the expression is his, more or less in this formula). He has an agile imagination and puts it to good use. The tone of the book is quite rewarding. He creates scenarios that extrapolate from our current situation at the same time giving us some insights about alternatives. "Who owns the future" is a proposal, just like You Are Not a Gadget was a manifesto. As a provocation (Lanier always uses the word utopia in a negative sense, presenting himself as pragmatic), I will say that "You are not a gadget" is for Lanier what Mutual Aid is for Pyotr Kropotkin and "Who owns the future" is like The Conquest of Bread. Meaning the first are the manifestos and the second are the ways to get there. This is little more than a personal way to organize ideas, though, since in no way Lanier makes a case for socialism or anarchism, quite the oposite. This book will appeal mostly, I believe, to those who are not willing to give up two specific dreams: the end of history, in Fukuyama terms, and information technology as liberation. The actual proposal is grounded in figures from the history of technology, like in Radical Markets there is a rehabilitation of some economics. In both cases there is the advocacy that the market is the best way to garantee that all citizens have the same oportunities and become full economic agents. In Lanier's case, he wants us to rethink our current model of "it's free so you are the product". Radical Markets is in a way a bit weirder: a free market coexists and garantees the abolition of property or at least the enabling of completely shared property. This book is excellent. In it, Jaron Lanier attempts to design a more humanistic economy in such a way that does not require government enforcement. Rather, the idea is to make large-scale changes so that the forces governing the economy naturally bolster the middle class. As things stand now, we are accustomed to giving our data away for free in exchange for free services such as Facebook (or Goodreads for that matter). The short term gains seem enticing, but Jaron argues that over the long run, This book is excellent. In it, Jaron Lanier attempts to design a more humanistic economy in such a way that does not require government enforcement. Rather, the idea is to make large-scale changes so that the forces governing the economy naturally bolster the middle class. As things stand now, we are accustomed to giving our data away for free in exchange for free services such as Facebook (or Goodreads for that matter). The short term gains seem enticing, but Jaron argues that over the long run, the costs are enormous; money is systematically siphoned away from the lower and middle classes while a select few are able to use their powerful "siren servers" to process this data and generate wealth. Vài nét về tác giả: Jaron Lanier là nhà nghiên cứu khoa học máy tính tại Microsoft Research, người tiên phong trong lĩnh vực Virtual Reality (thực tại ảo). Ông là người đồng sáng lập một số start-up, sau đó được Oracle, Adobe, Google mua lại. Ông cũng viết nhạc giao hưởng và chơi rất nhiều loại nhạc cụ hiếm. Trong cuốn sách thứ hai này (tiếp nối cuốn "You are not a gadget"), Lanier chỉ ra vấn đề với nền kinh tế dựa trên công nghệ số hiện nay, và đưa ra một tương lai mới để khắc phục những nhược Vài nét về tác giả: Jaron Lanier là nhà nghiên cứu khoa học máy tính tại Microsoft Research, người tiên phong trong lĩnh vực Virtual Reality (thực tại ảo). Ông là người đồng sáng lập một số start-up, sau đó được Oracle, Adobe, Google mua lại. Ông cũng viết nhạc giao hưởng và chơi rất nhiều loại nhạc cụ hiếm. Trong cuốn sách thứ hai này (tiếp nối cuốn "You are not a gadget"), Lanier chỉ ra vấn đề với nền kinh tế dựa trên công nghệ số hiện nay, và đưa ra một tương lai mới để khắc phục những nhược điểm ấy. Một quyến sách rất hay: nói về công nghệ cao với kiến thức của một chuyên gia, nhưng không vì thế đưa công nghệ ra ngoài tầm với của con người mà ngược lại, tác giả thể hiện một sự quan tâm rất lớn đến con người: Một mai công nghệ phát triển vượt bậc, liệu con người có bị bỏ lại đằng sau? Với sự phát triển của công nghệ với tốc độ như hiện nay, sẽ xảy ra những vấn đề gì? Trước tiên là một tập hợp những Siren Server (từ do Lanier đặt), là những hệ thống Internet cực mạnh thu thập một lượng khổng lồ thông tin, lớn đến mức bẻ cong cả hệ thống kinh tế, hút về phía chúng. Những ví dụ dễ thấy ở đây là Google, Facebook, Amazon, ... những gã khổng lồ này đều có một hệ thống rất nhiều servers, chạy những thuật toán rất mạnh để dựa trên lượng information khổng lồ mà nó có tạo ra lợi nhuận. Những ngành khoa học máy tính như Big Data, High Performance Computing hiện nay đang rất hot, chính là để phục vụ cho xử lý lượng thông tin khổng lồ này để sinh ra giá trị, lợi nhuận. Bây giờ lấy một ví dụ, Google Translate. Bạn có thể up một câu tiếng Tây Ban Nha lên Google cloud, bạn sẽ nhận lại một câu tiếng Anh khá chuẩn. Có thể bạn nghĩ là có một hệ thống trí thông minh nhân tạo nào đó ẩn trên cloud kia có thể dịch thuật một cách chuẩn xác? Nhưng thực ra không phải. Điều thực sự xảy ra là: Google thu thập rất nhiều các ví dụ dịch thuật do người thật thực hiện. Sau đó, nó thực hiện tính tương quan giữa các mẫu ví dụ này với câu bạn muốn dịch, từ đó đưa ra câu dịch chấp nhận được. Đương nhiên, để thực hiện quá trình thống kê này đòi hỏi hệ thống máy tính rất mạnh chỉ Google mới có. Nhưng về căn bản, hoạt động dịch thuật vẫn dựa trên con người thật. Thế nhưng, những con người đó lại hoàn toàn bị ẩn đi, không nhận được bất cứ lợi nhuận nào cả. Vấn đề nằm ở đây. Trong tương lai. hầu như mọi thứ đều do máy tính làm. Máy in 3D hiện giờ đang rất phát triển, chẳng mấy chốc mọi thứ sẽ đều có thể in ra từ máy in 3D, chỉ cần có design. Tưởng tượng đến một ngày, quần áo bạn mặc cũng do máy in 3D in ra theo một mẫu thiết kế nào đó. Bạn mặc xong, không cần phải giặt ủi nữa, chỉ cần cho vào máy in 3D nghiền ra, in ra một mấu khác, bạn tiếp tục mặc (!) Những vật dụng khác, như bàn ghế, giường tủ, xe cộ, ... đều có thể được in ra. Vậy thì ngành công nghiệp chế tạo sẽ bị ảnh hưởng đáng kể, một lượng lớn việc làm sẽ bị mất đi, phải không? Công nghệ hiện nay đang tiệm cận đến "software-meditated technology", mọi công việc rồi sẽ chuyển dần từ hardware sang software cả. Quay trở lại với hệ thống Siren Servers. Một điều đáng sợ là bây giờ con người đã phụ thuộc quá nhiều vào những hệ thống như vậy. Bạn nghĩ rằng bạn sẽ có thể bỏ hoàn toàn facebook? Khi mà hầu hết mọi người đều tham gia facebook, giao tiếp qua facebook thành một thói quen, bỏ facebook tức là bạn đã bỏ đi một phần rất lớn những mối quan hệ. Rất khó để có thể chấp nhận rủi ro như thế. Vậy để giải quyết vấn đề này, tác giả đề ra giải pháp nào? Trong nửa sau của cuốn sách, Lanier trình bày một mô hình gọi là humanistic information economy, trong đó dù công nghệ có phát triển đến đâu, con người vẫn là trung tâm. Ông đề ra hệ thống micropayment, ở đó mỗi người đều sẽ được trả lại một phần tiền dựa trên thông tin mà họ cung cấp cho Internet, nếu thông tin đó được sử dụng ở phần nào đó khác. Quay trở lại những ví dụ trên, người dịch thuật sẽ được trả một phần tiền nhỏ nếu Google dùng câu của họ trong Google Translate, người đưa ra mấu thiết kế quần áo sẽ được trả tiền nếu ai đó dùng thiết kế của họ cho máy in 3D... Ý tưởng là Siren Servers sẽ không còn có thể sử dụng thông tin mà bạn cung cấp một cách miễn phí như hiện tại để sinh lợi nhuận cho chúng nữa. Lanier cũng chứng minh làm như vậy sẽ gây dựng lại tầng lớp middle-class đang dần mất đi do việc làm ngày bị mất đi do công nghệ. Xây dựng lại phân bố giai tầng xã hội theo phân bố bell-curve là cần thiết cho một xã hội vững bền. Lanier presents thought-provoking ideas about the role the internet has played in reducing the middle class and sending us on a road towards a new feudalism. One of his principal ideas is that networks like the internet facilitate the power of what he calls "siren servers" (e.g., Facebook and Google), which, like stars coalescing in a new galaxy and increasing in gravity, attract more users, and power, the more users that they have. These siren servers then make a killing off of the personal inf Lanier presents thought-provoking ideas about the role the internet has played in reducing the middle class and sending us on a road towards a new feudalism. One of his principal ideas is that networks like the internet facilitate the power of what he calls "siren servers" (e.g., Facebook and Google), which, like stars coalescing in a new galaxy and increasing in gravity, attract more users, and power, the more users that they have. These siren servers then make a killing off of the personal information which they harvest from their users by selling it to their real clients, advertisers, and off of the creative content which they serve up to their users for free (or for next to free). So the labor of creative workers goes uncompensated, as does the labor of the users who expend large chunks of time submitting their personal data and opinions to the siren servers. Lanier's other principal idea is that these siren servers ought to provide micropayments to creative workers and users whenever their work or data is accessed by other users or advertisers, so that every participant in the network can be fairly compensated for what they contribute to the system. Lanier, however, is dismissive of politics, which he apparently wants to play no part in the internet whatsoever. But how does he expect this micropayment system to be implemented and enforced? Judging from past behavior, Google certainly isn't going to voluntarily start making payments to its users whose personal data it is selling or, heaven forbid, to the creative laborers whose work it exploits. Lanier also does not address the enormous role that venture capital and finance generally have played in elevating companies like Facebook and Google. Who Owns the Future? cannot be answered without looking at Who Owns the Present. The finance industry, both economically and through the power which, via campaign finance, it has exercised politically over the past thirty-five years, controls so much of our current circumstances, even when, as in 2008, it nearly falls apart completely. The wealthy are not going to part with their power and their unbelievable sense of entitlement (which they have passed on to the tech industry) unless they are forced to by politics. Without laws to influence and control the behavior of the finance and tech industries (and, of course, the effective enforcement of those laws), no progress is possible. Obviously, the future turned out quite a bit different from what we thought it would, almost completely devoid of space travel or robot butlers, while our cell phones do things the U.S.S. Enterprise's communications devices never could. One thing that we really did not think much about in the past was the rise of big data, and how the internet's number one way of making money would one day be putting ads in front of our faces. In Who Owns the Future?, Jaron Lanier, a pioneer of virtual reality t Obviously, the future turned out quite a bit different from what we thought it would, almost completely devoid of space travel or robot butlers, while our cell phones do things the U.S.S. Enterprise's communications devices never could. One thing that we really did not think much about in the past was the rise of big data, and how the internet's number one way of making money would one day be putting ads in front of our faces. In Who Owns the Future?, Jaron Lanier, a pioneer of virtual reality tech and Silicon Valley insider, questions the economic of the digital age, arguing that big data has made, overall, jobs disappear and concentrated the wealth in the hands of those next to the biggest and fastest servers. He calls these the "siren servers," which, once established, have an irresistible allure and an endless need for more data, public and personal. For Lanier, the biggest problem with this equation is not that these companies, such as Facebook and Google, get rich off their services, but that in the process that makes all the contributions we make each day disappear into the cloud, with our share of the work going largely unrecognized. Facebook is valuable because of all our posts and information, but in the end, our information is what is what is sold, with us cut out of the loop- "free" isn't really free. What Lanier proposes instead is a "humanistic economy," one where all of these little contributions are recognized and monetized. Links would go both ways, and when someone profits from your little contribution, you get little micropayments. It would be a radical change from the current winner-takes-all system, and one Lanier hopes would reinvigorate a sector of the middle class, and be better for the siren servers in the long term. Some of the best bits in the book are smaller arguments that support his main ideas. For example, I love his take on looking at capitalism as a technology more than as an ideology. If you love a technology, then you continue to work with it and integrate it to your modern circumstances, not seek some pure original version of it or discard it just because it doesn't work with a current problem. He also looks into technological utopianism, the legacy of hippie culture in Silicon Valley (look at a photo of Lanier, and you'll know why), and the economics of driverless cars. This is all tied in with his personal experience as a technology insider, and his time working with big corporations and small start-ups. Even when things seem a bit out-there, Lanier's passion and love for technology shine through, keeping things from seeming too dour. Lanier aims for a “humanist information economy”, and as a long participant in the non-free software economy including at Microsoft, Lanier carriers some biases about the price of information, which fatally undermine his very well written and carefully argued, very long exposition. In an homage (far longer than i believe is deserved) to Ten Nelson’s fundamental (yet so far technically unimplementable) idea that information should not be free, but rather compensated my micro royalties to creator Lanier aims for a “humanist information economy”, and as a long participant in the non-free software economy including at Microsoft, Lanier carriers some biases about the price of information, which fatally undermine his very well written and carefully argued, very long exposition. In an homage (far longer than i believe is deserved) to Ten Nelson’s fundamental (yet so far technically unimplementable) idea that information should not be free, but rather compensated my micro royalties to creators, Lanier gets mentally stuck on fundamentals of economics he seems to understand so well. There is just not enough economic value in the individual actions people take around the internet, for which he’d like people compensated. Even removing all "Siren Server" profits of $10-25B/yr, this doesn’t go very far when divided among over a billion participants. Much more effective that these corporations provide free services, at continually expanding and beneficial scale. Much better that more people have free communication and cheap internet data plans than a $25 rebate per year. So the simple fact is, most people will not “own the future” as a result of their contributions to the capitalist global economy. Robots, AI, massive corporations and elites will increasingly create leveraged economic value. Not “value”, but rather economic value. People still provide massive non-monetary value to society, and people still comprise the democratic “society” that the political economy is supposed to serve. You expand the economy not by *somehow* coercing information to not be free, which is hard if not impossible. You expand it by maximizing the utility of inexpensive or free services, so that everyone needs less money to still live a fully satisfied life. That results in demand deflation (as measured by traditional GDP) which can be counteracted only by decoupling the creation of value for society from the ability to purchase paid good in the global marketplace. Everyone just needs to be given enough money to fully participate in the economy (as a right) and then additional money can be allocated somehow based on productive contributions to society. Then Lanier’s goal of artists being able to survive of off free or cheap information goods is still possible, and his respect for mixed measures of status (respect not equaling monetary wealth) is enabled. I'm giving Jaron Lanier's work five stars for the fact that I must have turned down the corner on a hundred pages because the book is thought-provoking. Three stars go to the editor. This is my second review of a book where I blame the dev edit of a book. In this case I think Jaron's work could have been more concise and a hundred or so pages lopped off and nothing would have been lost. I blame the loss of that editor on exactly what Jaron writes about in his book--the loss of a middle class due I'm giving Jaron Lanier's work five stars for the fact that I must have turned down the corner on a hundred pages because the book is thought-provoking. Three stars go to the editor. This is my second review of a book where I blame the dev edit of a book. In this case I think Jaron's work could have been more concise and a hundred or so pages lopped off and nothing would have been lost. I blame the loss of that editor on exactly what Jaron writes about in his book--the loss of a middle class due to our new masters the Siren Servers. If you are a technology or publishing professional or if your job has even been touched by technology for better or for worse you should read this book. If you read Chris Anderson's book Free: How Today's Smartest Businesses Profit By Giving Something For Nothing several years ago and you thought at the time that Chris was full of cr** because you were worried that that model would destroy the middle class then read this book. (Or maybe that was just me watching him talk in a Microsoft Research author talk). If you read Tim Wu's the Master Switch and saw the brilliance in that book--there is something here for you as well. Because what Tim predicted is coming true. If you have ever wondered why Google and other Search Engines which used to be so useful seemed to be less so because you can't clear your way past the content marketing then this book is for you. If you were amazed at how twitter was used to bring us closer during events like the Oscars and the SuperBowl and yet horrified that organizations like ISIS are using it to recruit people than this book is for you. This is a controversial but fascinating look by a brilliant mind into the state of what technology has wrought and his personal manifesto on how to fix it. I'm not sure I fully agree with his plan--but I do think we need to start talking about what will replace our currently broken economic system in the future. We all know that we create value for gigantic companies by providing information, voluntary as well as involuntarily, and that this is "just the price you pay" for getting to play with services like Facebook, Uber, or Meerkat. I think if more people read this book, we might have a better idea as to how unbalanced that exchange really is. Reading "Who Owns the Future?" not only explores that concept in more depth, it also looks at how the giant Internet companies which influence all our lives h We all know that we create value for gigantic companies by providing information, voluntary as well as involuntarily, and that this is "just the price you pay" for getting to play with services like Facebook, Uber, or Meerkat. I think if more people read this book, we might have a better idea as to how unbalanced that exchange really is. 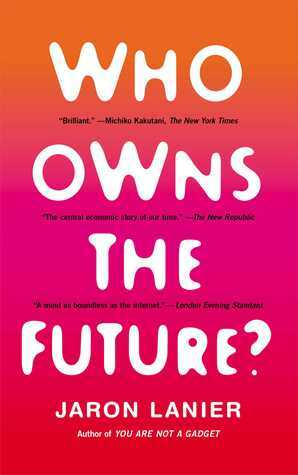 Reading "Who Owns the Future?" not only explores that concept in more depth, it also looks at how the giant Internet companies which influence all our lives have been, and continue to, coring out not only the creative class but the middle class in general - and boldly attempts to provide a leaping off point for a different model of information economy that doesn't inherently shrink markets while disenfranchising the vast majority of humanity. Like anybody trying to friggin' REINVENT AN ECONOMY, Lanier sometimes stumbles in his book's third act. He does, however, do his best to own his own faults while stressing that there is no such thing as a perfect economy or other societal system - only that which has a more or less optimum balance of pros and cons. In his final few chapters he isn't trying to proclaim himself the one true prophet or anything, only to honestly, intelligently, fumble toward a more optimum balance where people are viewed as having value beyond being components in a larger system. Gave up after 25 pages. Don't know what people see in this guy. Some interesting ideas, but so far from the present reality that I don't know how useful they are. June 21. Lanier is a futurist, but he's a realistic one: no fluffy science fiction technological utopias are dangled here. There's this idea among some popular futurists of a "post-scarcity economy" -- that humans will become digital and upload themselves into the cloud. How this will happen seems to be explained with much hand waving, along the lines of "and then a miracle occurred." However, Lanier argues that the way we use digital technology today is not going to make everything all right in June 21. Lanier is a futurist, but he's a realistic one: no fluffy science fiction technological utopias are dangled here. There's this idea among some popular futurists of a "post-scarcity economy" -- that humans will become digital and upload themselves into the cloud. How this will happen seems to be explained with much hand waving, along the lines of "and then a miracle occurred." However, Lanier argues that the way we use digital technology today is not going to make everything all right in the future. In fact it's just the opposite, and something needs to change. Humans will remain human, and we will continue to have needs. Machines don't have human intelligence and cannot replace us, or be us, in the foreseeable future. They will not make us obsolete; humans are necessary for their existence. This book was an assignment of a book group I am in, and I really didn't know what it was about except what I learned watching a video of an interview of the author. What I see as the main message upon reading the introduction is that the wealth inequality we are experiencing today is not attributable to politics and finance so much as to digital networking. The amassing of data in huge server farms results in concentration of power and wealth. He who has the biggest computer wins. When we ordinary people get "free" digital services, we pay for them with much more valuable things: freedom of choice, security, privacy. We do this voluntarily, but perhaps not consciously. We are lazy and cheap, and we are paying in unprecedented ways, ways that were not anticipated by the creators of this monster. And the author is one of those creators. I think he is trying to right the wrongs with this book. So I'm about eleven percent in and I feel like I've gone down the rabbit hole of a brilliant mind. There are multitudes of maxims and axioms and metaphors, and I don't know which are true. It's like a stream of consciousness and the author goes all over the place with lots of arguments for how things got the way they are, what will happen if they continue on the path they're on, and, I suppose, what can and should be done to fix them. But it's complicated. It's economics, essentially, and he looks at it from so many viewpoints and offers so many explanations that my head is spinning. A very important point is that the income inequality that we are experiencing is, he says, due to computing inequality. It's the information age. Information is the new money and whoever controls the biggest computer wins. And it's winner take all, like American Idol. The rich get richer, the poor get poorer, and the middle class disappears. The system is not sustainable, because the winners need a middle class to sustain them. He says this star system needs to be replaced by the bell curve, where the wealth is more evenly distributed; that the value of the data that the top people profit from is generated by ordinary people, who currently give it away (for small rewards, such as "free" searching and networking). Those ordinary people are the middle class. He argues they should be compensated for what they create. There was this idealistic idea early in the digital age that information should be free. One result of that is the loss of a living for musicians and journalists, as their products became digitized and freely shared. He says the same thing could happen to heart surgeons and everyone else, given enough technological innovation. We used to worry that computers would take our jobs. At first they generated more jobs as people were needed to develop the technology and run the computers, but that is no longer the case. The author was in on this trend on the ground floor. Some of his colleagues have amassed great wealth. But besides being a "quant," he's a musician and a writer. He has seen what big data has done to the recording and publishing industries. What started as an ideal of free data sharing has cost many people their livings, and he doesn't see it ending with musicians and authors. The trouble is that a middle class is needed to support the system or it will collapse. So he has an idea to restore balance. Compensate people for the value they are currently giving away. What is different here from other theories about wealth inequality is that blame is not being laid and punishment and/or restitution are not being demanded. It is an argument that what seemed like a good idea at the time has gotten out of control. The problem isn't necessarily digital networks; it's how they are being used. If they can be used to spread wealth rather than concentrate it, a balance could be reached. I hope the people at the top are listening. Though game theory experiments have shown that natural selection weeds out the consistent defectors, I am not optimistic that the short-term thinking and greed that got us into this mess will change fast enough. The author says none of this was intentional, but someone has to have wondered if all their gains meant losses for everyone else: that it was a zero-sum game. Did they know the losers were the very people they relied upon to obtain and maintain their position at the top of the heap? Did they care? The most frustrating thing is that there is no incentive for them to change because they have a safety net -- you and me. After their risky behavior in the mortgage industry caused massive losses to the public, they were bailed out by their victims. They paid no fines and served no time. In fact, some of them are now financial experts, professors, and government advisors. THEY TOOK ALL THE PROFITS AND WE TOOK ALL OF THE RISK. This downplaying of the guilty by the author and his positive suggestions of ways to get out of the mess are more productive than anger, but the more I think about the way things got this way, the madder I get. Okay, off the soapbox and back to the hopeful message of this book. The author terms his solution the "humanistic information economy." July 1. Just finished chapter 12 on free will. As with most discussions I've read and heard on the subject, I found it incomprehensible. July 4. I was listening to an interview on the radio. They talked about the recovery, stock market, jobs, housing, the banking failures, the continued risky behavior of Wall Street and whether regulation (Dodd-Frank) is enough to head off another. Digital networking and big data are never mentioned in the news. Is Lanier the only person who sees this? He says regulation won't be able to keep up with Siren Servers. July 5. Important points. The author's description of the problem: Digital Networking (Big Data) and the value of ordinary human contribution to such data increasingly being taken off the books and wealth and power being concentrated around Siren Servers. The author's term for the proposed solution: Humanistic Information Economics. The author's term for systems that support the middle class, such as unions, tenure, social programs, licenses, copyrights, etc: Levees. His description of how the digital networking economy currently works: the most successful businesses are the Siren Servers; the advertisers are the Customers; we (or the personal information we give away) are the Product. The Sixth Interlude, at page 211 ("The Pocket Protector in the Saffron Robe"), is an amusing skeptical look at the weird combination of tech and new age in Silicon Valley. He talks about est, Gurdjieff, The Secret, The Singularity. An important part of the recovery he proposes has to do with the economic theories of one Ted Nelson explained in Chapter 18. Nelson, whose ideas predated the information age, called the concept Xanadu, and I don't really understand it, but an important part is two-way linking, which would allow sources of data to be tracked, and compensated. July 12. I'm nearing the end, but what a struggle it has been! The proposed solutions to the problems are as vague as the problems themselves. The thing is it's a whole cluster of interrelated systems and the relationships are in flux and it's all growing exponentially. It's the economy. You might as well explain (and predict) the weather while humans pump carbon into the atmosphere. Anyway, what's important is that technology moves much too fast for regulation to keep up. The author proposes instead finding a way to compensate ordinary people who contribute the data. That would involve ownership of digital rights, or licensing of so much of what we are currently giving away. It's an unpopular concept, but it would even the playing field, expanding rather than shrinking markets, and generating income for the middle class. How is that to be done? It's complicated and messy, and it would involve middlemen and lawyers. But basically, the argument is that a commercial solution would work better than government regulation. In the chapters on "creepiness," regarding security, privacy, and identity, he looks at good and bad ways our data is and can be used. I miss the future. We have such low expectations of it these days. When I was a kid, my generation reasonably expected moon colonies and flying cars by now....And yet, the future hasn’t vanished completely. My daughter, who turned six as I finished this book, asks me: “Will I learn to drive, or will cars drive themselves?” In ten years, I imagine, self-driving cars will be familiar, but probably not yet ubiquitous. But it’s at least possible that learning to drive will start to feel anachronistic to my daughter and her friends, instead of a beckoning rite of passage. Driving for her might be like writing in longhand. It is irrelevant how accurate these predictions are; the value rests within the thought exercise, in bringing, “What’s wrong with today, and how can I make it better tomorrow?” to the forefront. It is a refreshing change from the certainty that typically spews forth from the pages of most modern futurism—certainty that helps move product and embraces a timeline of irrefutability that extends just until the expiration of the novel's commercial viability—or the resignation of dystopian techno-determinism to the encroaching bleakness. Efforts like Linux and Wikipedia might have weakened some old centers of power, but that only created the space for new centers of power. In what sense is becoming dependent on private spy agencies crossed with ad agencies, which are licensed by us to spy on all of us all the time in order to accumulate billions of dollars by manipulating what’s put in front of us over supposedly open and public networks, a way of defeating elites? And yet that is precisely what the “free” model has meant. “Free Google tools and free Twitter are leading to world where everything is free because people share, but isn’t it great that we can corner billions of dollars by gathering data no one else has?” If everything will be free, why are we trying to corner anything? Are our fortunes only temporary? Will they become moot when we’re done? It’s not the only twist of its kind. The Wall Street mogul and the young Pirate Party voter sang the same song. All must be made fluid. Even victims often cheered at the misfortunes of people who were similar to them. Because so many people, from above and below, never liked levees anyway, there was a triumphalist cheer whenever a levee was breached. We cheered when musicians were freed from the old system so that now they could earn their livings from gig to gig. To this day we still dance on the grave of the music industry and speak of “unshackling musicians from labels.” We cheered when public worker unions were weakened by austerity so that taxpayers were no longer responsible for the retirements of strangers. Investors are perfectly confident to value a Siren Server that accumulates data about people in the tens of billions of dollars, no matter how remote the possibility of an actual business plan that would make a commensurate amount of profit. And yet, at the same time, these same investors can’t imagine that the people who are the sole sources of what is so valuable can have any value. …[I]f someone complains that all those brilliant recent PhDs ought to perhaps be working on something more substantive than putting yet more paid links in front of people, you can expect a rigorous defense of the nonmonetary value being created by today’s cloud computing. Twitter doesn’t yet know how to make much money, for instance, but it is defended this way: “Look at all the value it is creating off the books by connecting people better!” Yes, let’s look at that value. It is real, and if we want to have a growing information-based economy, that real value ought to be part of our economy. Why is it suddenly a service to capitalism to keep more and more value off the books? What all this comes down to is that the very idea of artificial intelligence gives us the cover to avoid accountability by pretending that machines can take on more and more human responsibility. This holds for things that we don’t even think of artificial intelligence, like the recommendations made by Netflix and Pandora...these algorithms do not represent emotion or meaning, only statistics and correlations. What makes this doubly confounding is that while Silicon Valley might sell artificial intelligence to consumers, our industry certainly wouldn’t apply the same automated techniques to some of its own work. Choosing design features in a new smartphone, say, is considered too consequential a game. In a world of efficient 3D printing and recycling we might experience much, much faster turnaround in our material culture than we are able to easily conceive of today. A guitarist might routinely print out a new guitar for each gig. Snobs might very well then decry that much of the design churn is stupid and pointless, just as critics might say the same about today’s social network kinetics. But if people are interested in finding the latest stupid cool guitar to fabricate for the day, there will be a stupid cool guitar designer out there who ought to be paid. Amidst our gadget-swoon, nobody is talking about what Jaron Lanier talks about: Who OWNS the massive, vast sea of data that we've all collectively generated over the last twenty years. Lanier is absolutely not anti-technology. Rather, he's seeing further ahead than most of us about its socioeconomic implications -- no, not the implications of USE, the digital divide or shortened attention spans or any morphing of social etiquette -- but the implications of big-data capitalism: Who's gonna OWN it Amidst our gadget-swoon, nobody is talking about what Jaron Lanier talks about: Who OWNS the massive, vast sea of data that we've all collectively generated over the last twenty years. Lanier is absolutely not anti-technology. Rather, he's seeing further ahead than most of us about its socioeconomic implications -- no, not the implications of USE, the digital divide or shortened attention spans or any morphing of social etiquette -- but the implications of big-data capitalism: Who's gonna OWN it all? We have all become unwitting means of production, and most of us have only the vaguest idea of the details. Yikes ... we're not even over post-industrialism, and now we have to deal with this?! Lanier's answer is not paranoia, though; it's not digital lock-down, it's not romanticized retreat. It's how can each of us little data-generating ants get compensated for our little piece of the pie? What's our micro-royalty when we "allow notifications" and so on? Lanier doesn't use this particular example (IIRC), but his thoughts bring to mind the awesome, continent-shaping power of the railroads in the 19th Century. Obviously, we know what they did then ... but did you know that they STILL retain legal privileges not granted to any other businesses or groups well into the 21st Century, i.e. right now? If they own a right-of-way, it might as well be consecrated ground, and local governments (let alone other businesses) have almost zero standing against many railroad claims. The point is, when a powerful new business emerges, especially if it become the connective tissue of an economy, the rights it grabs for itself during its formative years are likely to last on and on in perpetuity. If a government -- which is to say, a citizenry -- wants to regulate such a powerful force, it's better to act sooner rather than later. The main argument: Not so long ago the Internet was seen as the next great economic engine. The optimism was never higher than at the peak of the dot-com boom in the late 1990s, of course; but even after the dot-com bust in the early 2000s, many believed that this was but the growing pains of an emerging industry, and that in the long run the Internet would yet provide the foundation for a new and improved information economy. Since that time, it is certainly the case that the Internet has spawned a few major successes (such as Google, Amazon, eBay and now Facebook), as well as a host of hopefuls (such as Twitter, Kickstarter, Pinterest and Instagram). However, it cannot be said that the economy has enjoyed a great boost since the Internet exploded. On the contrary, the economy has, at best, stagnated--and it currently shows no signs of escaping its slump. So what went wrong? According to Silicon Valley luminary Jarion Lanier, the problem is not so much with the Internet per se, but with how it has been set up, and how the major Internet companies themselves are organized. To begin with, major Internet companies tend to form monopolies, or near-monopolies, and on a global scale (mainly because Internet networks are able to reach a global audience and undercut local players, but also because these networks are more valuable to their users as they grow larger [for instance, it is most convenient to just join Facebook to connect with friends because this is the platform that most people, for whatever reason, have come to use--it just simplifies things]). The formation of monopolies and near monopolies destroys competition, of course, which compromises economic growth. As we can see, then, a big part of the value of these Internet companies comes from their users' content and information--as well as the content of third parties whose material is being shared no end. Now, if these users and content providers were being paid fairly for their contributions (according to how much value they bring to the Internet companies, and other Siren Servers, who use it), we could surely expect a major economic boost as a result. Instead, the users and content providers are paid nothing for their contributions (or at most a fraction of what their contributions represent). The end result of this is that wealth is concentrated at the top--in the hands of the major Internet companies and other Siren Servers--and the economy as a whole suffers (since few jobs are created to allow the wealth to trickle down). And that's just the beginning. The fact is that more and more things are being digitized as we move forward (for instance, driving is being digitized through driverless cars, education lessons are being digitized through being recorded on digital equipment, and even physical objects are being digitized through 3D printing). As things become digitized they become capable of being shared over the Internet for next to nothing. This will inevitably mean the further erosion of productive jobs (and whole industries--such as has already occurred in the music and video industries). Ultimately, the only wealth-generating endeavor left will be the Internet platforms that share all of this information--or provide other free services. Of course, with nothing productive left to advertise, their revenues will fall off as well, so even they won't be making any money. For Lanier, this is the fate we can expect unless we change the game we are currently playing. The long short of it is that we must find a way to pay people adequately for the information and content they contribute to the information economy. Lanier argues this means reorganizing the Internet in such a way that informational transactions are monetized--such that the users of information are charged and the providers are paid for each transaction. It is not going to be easy to reorganize the Internet in this way-not only technically, but also because we have all become accustomed to using the Internet the way it is (and we like getting things for `free'). Ultimately, though, we will have no choice, for our current course is leading us to an economy that is dominated by wealth at the top--and eventually no wealth for anyone. At some point, this state of affairs must lead to a revolt and/or a complete breakdown. You're either going to love this book or hate it. Jaron Lanier is a recording musician, video game creator, computer scientist, and founding father of virtual reality. As you can imagine, a man of his talents is not exactly even-keeled. Like your brilliant friends, he is prone to rants that spin in circles. However, you end up listening to him, because he remains so utterly fascinating. Mr. Lanier's central conjecture in this book is that people should start becoming compensated for information th You're either going to love this book or hate it. Mr. Lanier's central conjecture in this book is that people should start becoming compensated for information they contribute online. He believes the rapidly vanishing middle class is due to information being made free, and that this can be remedied. He hopes that monetizing people's online contributions will lead to a larger middle class and a more robust economy. His writing style is snappy. He is a lucid thinker and fun to listen to. He is one of the more well-spoken proponents of many left-leaning ideas and principles. He does hop from topic to topic, and he admits he can't foresee many of the issues that would come from some of the changes he proposes. The man makes so many good points that you just ignore his foibles. You really do get a feel for what endangers us in the future, and what could help us. Highly recommended for the futurist nerds. I couldn't put it down. Jaron Lanier scientific interests include biomimetic information architectures, user interfaces, heterogeneous scientific simulations, advanced information systems for medicine, and computational approaches to the fundamentals of physics. He collaborates with a wide range of scientists in fields related to t Jaron Lanier is a computer scientist, composer, visual artist, and author. Jaron Lanier scientific interests include biomimetic information architectures, user interfaces, heterogeneous scientific simulations, advanced information systems for medicine, and computational approaches to the fundamentals of physics. He collaborates with a wide range of scientists in fields related to these interests. Lanier's name is also often associated with Virtual Reality research. He either coined or popularized the term 'Virtual Reality' and in the early 1980s founded VPL Research, the first company to sell VR products. In the late 1980s he led the team that developed the first implementations of multi-person virtual worlds using head mounted displays, for both local and wide area networks, as well as the first "avatars", or representations of users within such systems. While at VPL, he and his colleagues developed the first implementations of virtual reality applications in surgical simulation, vehicle interior prototyping, virtual sets for television production, and assorted other areas. He led the team that developed the first widely used software platform architecture for immersive virtual reality applications. Sun Microsystems acquired VPL's seminal portfolio of patents related to Virtual Reality and networked 3D graphics in 1999. From 1997 to 2001, Lanier was the Chief Scientist of Advanced Network and Services, which contained the Engineering Office of Internet2, and served as the Lead Scientist of the National Tele-immersion Initiative, a coalition of research universities studying advanced applications for Internet2. The Initiative demonstrated the first prototypes of tele-immersion in 2000 after a three-year development period. From 2001 to 2004 he was Visiting Scientist at Silicon Graphics Inc., where he developed solutions to core problems in telepresence and tele-immersion. He was Scholar at Large for Microsoft from 2006 to 2009, and Partner Architect at Microsoft Research from 2009 forward. Lanier has received honorary doctorates from the New Jersey Institute of Technology and Franklin and Marshall College, was the recipient of CMU's Watson award in 2001, was a finalist for the first Edge of Computation Award in 2005, and received a Lifetime Career Award from the IEEE in 2009 for contributions to Virtual Reality. Lanier is a well-known author and speaker. Time Magazine named him one of the 100 most influential people in the world in 2010. His book "You Are Not a Gadget" was released in 2010 and was named one of the 10 best books of the year by Michiko Kakutani in the NY Times. He writes and speaks on numerous topics, including high-technology business, the social impact of technological practices, the philosophy of consciousness and information, Internet politics, and the future of humanism. His lecture client list has included most of the well-known high technology firms as well as many others in the energy, automotive, and financial services industries. His writing has appeared in The New York Times, Discover (where he has been a columnist), The Wall Street Journal, Forbes, Harpers Magazine, The Sciences, Wired Magazine (where he was a founding contributing editor), and Scientific American. He has edited special "future" issues of SPIN and Civilization magazines. He is one of the 100 remarkable people of the Global Business Network. In 2005 Lanier was selected as one of the top one hundred public intellectuals in the world by readers of Prospect and Foreign Policy magazines. As a musician, Lanier has been active in the world of new "classical" music since the late seventies. He is a pianist and a specialist in unusual musical instruments, especially the wind and string instruments of Asia. He maintains one of the largest and most varied collections of actively played rare instruments in the world. Trivia About Who Owns the Future? Quotes from Who Owns the Future?